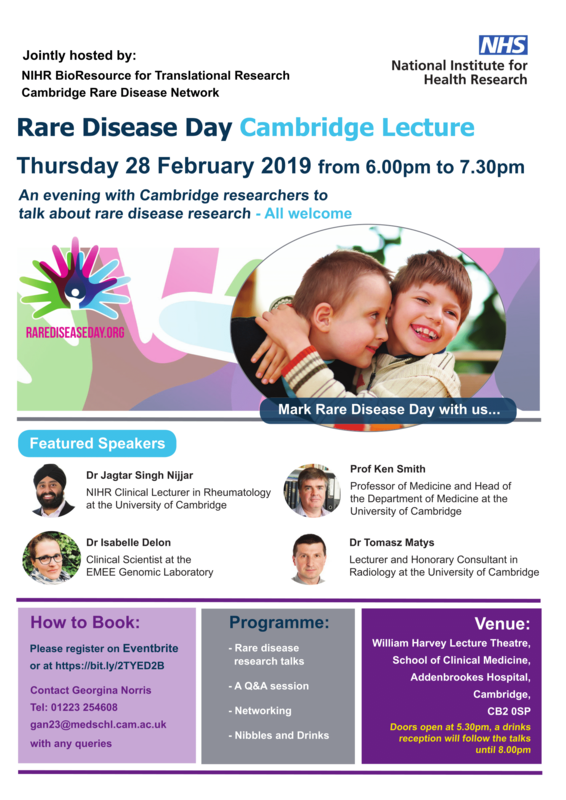 Rare Disease Day evening lecture and networking event- All are welcome. It will highlight Rare Disease Day and rare disease research, with speakers from the following fields: Neuroscience, Rheumatology, Genomics, Immunology and Radiology. There will also be a chance to ask your research questions in a live Q&A session with all the speakers. 2019 marks the twelfth year that the internationally rare disease community will celebrate Rare Disease Day. On 28 February 2019, people living with or affected by a rare disease, patient organisations, politicians, carers, medical professionals, researchers and industry will come together in solidarity to raise awareness of rare diseases. This year’s theme is ‘Bridging health and social care’.